Jody cautioned me not to create any titles with “babies” and “blood” in them. Then she made the tactical error of going to work. Herewith Dutch Babies with Blood Oranges. C’mon, like you wouldn’t have done the same thing? Besides, after last week’s Attack of the Devil Baby* prank on New Yorkers, I figured you could handle it. What’s a little shudder when these “babies” taste so good, when the payoff is having a hot air balloon collapse in front of you, its final gasps scented with vanilla, cinnamon, orange and lemon? What name would you choose for this wheezy pastry–Dutch baby or German pancake, the main alternative? Dutch babies sound playful, easy, maybe even good for you. German pancakes, whatever their other virtues, convey an air of seriousness. “Time for German pancakes!” could be a euphemism for “Let’s build a railroad through the Black Forest.” So what’s your choice? Light-cuddly-easy? Or Heavy-serious-Hans-Henry-was-a-steel-drivin’-man? Right. Dutch babies it is. And don’t forget the blood oranges. We’re back on course to the next Blue Zone* – the Nicoya Peninsula of Costa Rica! Casado – the married man’s lunch is our take on a Nicoyan central meal of the day, protein and salad along with a foundation of black beans and rice seasoned with a particular Costa Rican twist. The Nicoya Peninisula is a 80-mile long thumb of land that juts into the Pacific from the northwest corner of Costa Rica. Among a certain type of backpacking tourist the peninsula is famous for its many beaches which ring the coastline. But the Blue Zone of the Nicoya Penisula does not include the coast – it is the interior, home of large national parks, still quite rural, and with many inhabitants living traditional lifestyles either as independent farmers or as sedentary agricultural workers finding employment on larger farms, and raising corn, beans, and other vegetables (including two forms of taro) in their own family plots. Until recently the Nicoya Peninsula was relatively isolated, reachable only by ferry until 2003, which saw the opening of the Taiwan Friendship Bridge. At first glance the Nicoyan diet may not seem that remarkable–rice, beans and tortillas–along with a lot of fruit. But at 60 a Costa Rican man has about twice the chance of reaching 90 as one from the U.S., and this from a country whose medical budget is about 15% of that of the U.S. Nicoyans are some of the healthiest, most long-lived people on the planent. Say hello to Casado – beans and rice with all the fixings. When Jody said, “Hey let’s do Shirred Eggs with Spinach, Mushrooms and Toast Soldiers,”* I responded with an enthusiastic, “Huh?” Something stirred in the part of my brain where meal descriptions from Dickens and Wilkie Collins rattle around with episodes of Jewel in the Crown, Upstairs, Downstairs and Downton Abbey, reasonably accurate associations because Googling shirred eggs brings up the original 1896 edition of Fanny Farmer. She explains that shirred eggs are baked; the name derives from the dish used in the preparation, an egg-shirrer, a shallow gratin dish for baking the eggs. Did you catch that? …are baked …for baking the eggs. That’s it, the whole circus? I mean, shirred means baked? Ceci ce n’est pas une poste. This is not a post–it’s a reminder of what you can do with dukkah. 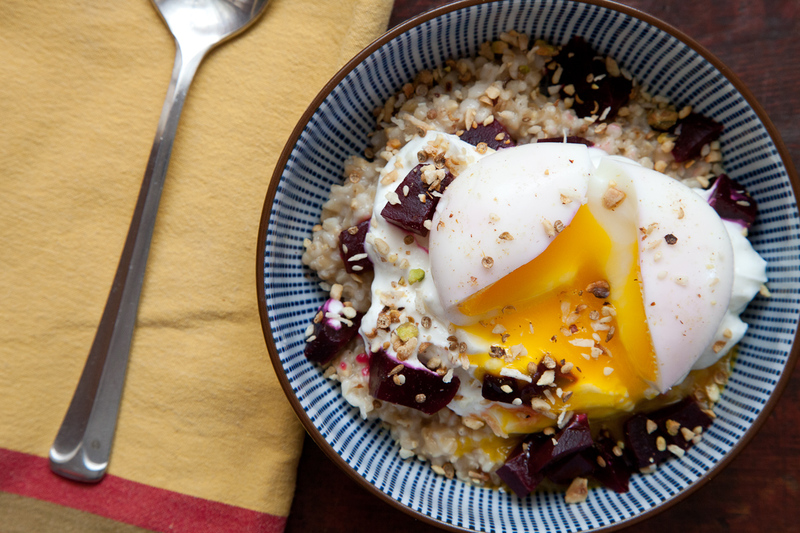 In this case, breakfast: steel-cut oats with Greek yogurt, diced beets, a soft-boiled egg and dukkah. If I’d had leftover roasted carrots, or a little braised fennel, or some kale… well, you get the picture. You get a whole grain and a vegetable with some protein under your belt and you haven’t even left the house yet. Don’t bother clicking on the MORE link. There is no more. This is it. When Jody and I signed up for the cycling fund-raiser the PanMass Challenge last year we stepped up our game when it came to exercise. Speaking exclusively for my Falstaffian self, I thought it might not be a bad idea to drop a few pounds ahead of the actual 200-mile 2-day ride. 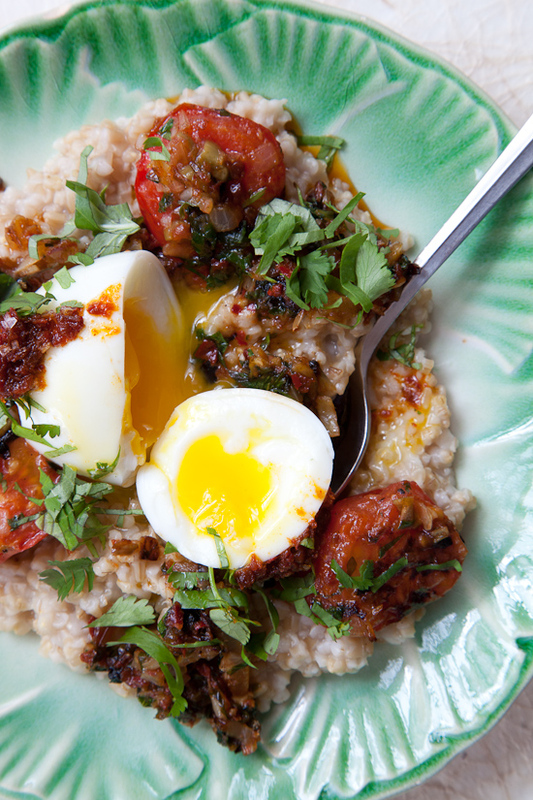 That’s how we ended up making dishes like Steel-Cut Oats with Eggs, Preserved Lemon and Olives. But it was a journey to get there.